Straightening Hair is no longer a time-consuming and expensive process, thanks to amazing flat irons such as this Babyliss Pro Nano Titanium Iron. Here's a product that is efficient, durable and extremely budget friendly. Discussed below and is strongly recommended to straighten your hair nicely. This unique straightener works as a curler as well. A curling iron can also be bought for curls, but the shape that a straightener gives is much better as compared to the curler. This straightener is recommended for tighter curlers because it's around one inch and the thickness of the straightener decides how big the curls will be. offers little lovely curls and every easy to operate and get curls that shall make everyone else jealous. As compared to other straightening rods, its body is a little bit different because its plates are built using titanium. Also, the plates are not covered with any other nonmetallic covering. There is a vast difference between metal and ceramic plates. A good thing about this product is that the length of the plate is about 5 inches and its much more as compared to the standard size of the plates. Hair can be grabbed quickly in one single go. Different sizes of irons are available in the market, i.e. about 1-1.5 inch. For a good curl select the 1 inch and if the length of your hair is long, a 1.5-inch size should be good enough. The heat setting temperature is up to 450 degrees, and that makes it so fast in its working. 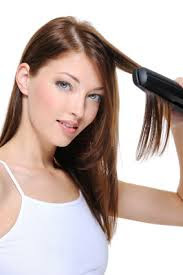 There are a ton of flat irons that get hot quick, but if we talk about sensitivity and heat application, the Babyliss Nano Titanium is one of the best products that treats hair with outstanding care. 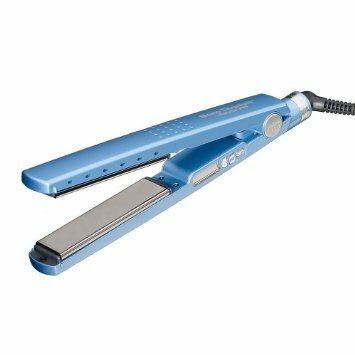 Since this straightener is titanium coated, it is likely to release the negative ions that help to lock the moisture into the hair. This quality will prevent hair from getting dull and damaged. One of the only drawbacks of this Babyliss Nano Titanium Iron is that it stays on until shut off manually. Unlike more sophisticated models that have built-in timers and sensors that detect when the iron is not in use and switch off automatically, this flat iron requires the user to turn it off after finishing. However, considering all the great features that this flat iron offers, the lack of this feature barely figures in as a drawback. The Babyliss Pro Nano Titanium Straightening Iron has received much attention from the online shopping community. It has been awarded an impressive 4 out of 5 stars on Amazon and has received a great 1318 customer reviews. The majority of the reviews are positive, and most clients feel that this iron is amazing for straightening as well as curling hair. It's very hard to decide between titanium and ceramic plates. Most of the professional hair experts recommend titanium because they provide ultra temperature settings and fast heating features. Couple these settings with the sleek body and shape of this product and you have one of the best irons on the market. Author Bio: Hi guys, My name is Miranda, and I am a professional hairstylist based in New York. I have been in the fashion industry for the past 10 years and have been graced to work with the some of the top ranking professionals in the field. This year marks my 10th anniversary as a professional stylist, and I’m looking to make it count and share all that I have learnt.